To echo what I mentioned in the intro, the obvious reason is that you don't want to duplicate code. The other reason is that each of these elements now has their addEventListener property set. This is not a big deal for five elements. It starts to become a big deal when you have dozens or hundreds of elements each taking up a small amount of memory. The other OTHER reason is that your number of elements, depending on how adapative or dynamic your UI really is, can vary. It may not be a nice fixed number of five elements like we have in this contrived example. 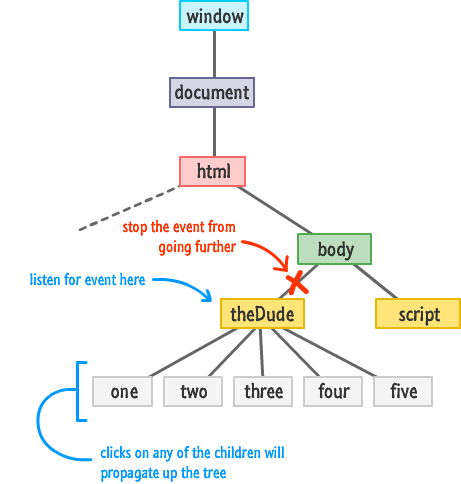 Create a single event listener on the parent theDude element. 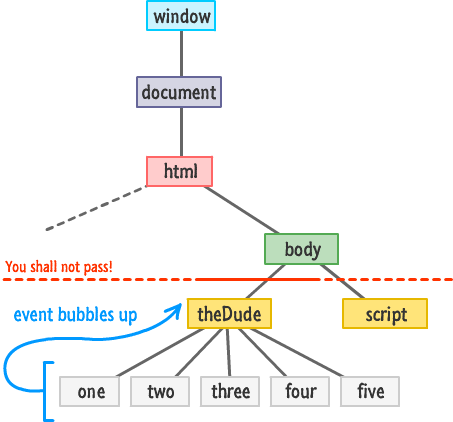 When any of the one, two, three, four, or five elements are clicked, rely on the propagation behavior that events possess and intercept them when they hit the parent theDude element. 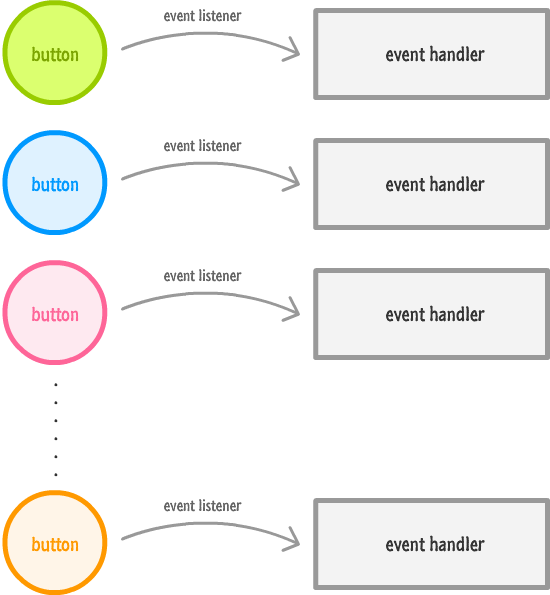 Stop the event propagation at the parent element just to avoid having to deal with the event obnoxiously running up and down the DOM tree. The target of the event is represented by e.target, and the target element the event listener is attached to is represented by e.currentTarget. By simply checking that these values not be equal, you can ensure that the event handler doesn't react to events fired from the parent element that you don't care about. Notice that this code is actually outside of my if statement. This is because I want the event to stop traversing the DOM under all situations once it gets overheard. Because all of the event arguments are still tied to the source of the event, you can target the clicked element in the event handler despite calling addEventListener on the parent. The main thing to call out about this solution is that it satisifies the problems we set out to avoid. 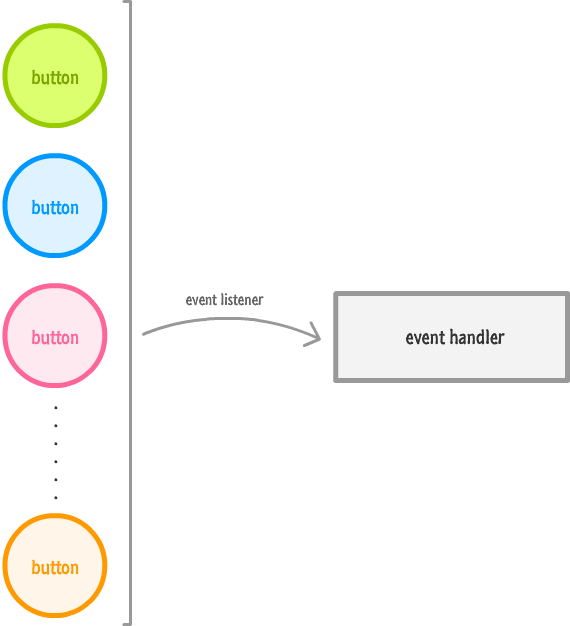 You only created one event listener. It doesn't matter how many children theDude ends up having. 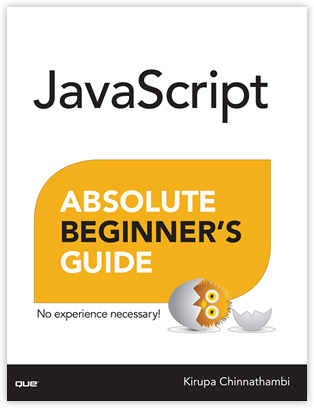 This approach is generic enough to accommodate all of them without any extra modification to your code. For some time, I actually proposed a solution for our Multiple Element Eventing Conundrum (MEEC as the cool kids call it!) that was inefficient but didn't require you to duplicate many lines of code. Before many people pointed out the inefficiences of it, I thought it was a valid solution. The reason this approach isn't great is because each child element has an event listener associated with it. This goes back to our efficiency argument where this approach unnecessarily wastes memory. Now, if you do have a situation where your elements are spread throughout the DOM with no nearby common parent, using this approach on an array of HTML elements is not a bad way of solving our MEEC problem. If you have a question about this or any other topic, the easiest thing is to drop by our forums where a bunch of the friendliest people you'll ever run into will be happy to help you out! Get cool tips, tricks, selfies, and more...personally hand-delivered to your inbox! Serving you freshly baked content since 1998!